Govanhill Baths Community Trust‘s goal is to re-open the Govanhill Baths as a Wellbeing Centre and at the same time contribute to the wider social, cultural and built regeneration of Govanhill as a community through a range of activities. GBCT wants the Baths to be a place of inspiration and comfort, of relaxation and integration, and of fairness and team-working. The refurbishment of the building should meet all of these goals, while providing a clear welcome to all members of Govanhill’s community. GBCT is a grass roots charitable organisation, set up in 2001 in response to the closure of the much-loved Calder Street Baths by Glasgow City Council. We believe that we showcase what can be achieved through community participation. GBCT comprises a management Board of 12 people, a staff of 6, over 750 volunteers, and more than 1,000 members. Over 1,500 residents (10% of the population) took part in community consultation, and approximately 18,000 people come through the doors each year. GBCT is known and respected as being the community-leading organisation in Govanhill and the most inspiring example of community empowerment in Scotland. Its history in leading the original sit-in protest, the longest occupation of a civic building in UK history, at the closure of Baths still carries a great deal of resonance in the local community. The Baths are an important hub, not just for wellbeing but as a resource for a wide range of people, charitable organisations and community groups. The current programmes help to show GBCT’s determination to create opportunities for local residents, despite an inhospitable environment. With a refurbished building where all spaces were dry, warm and safe, GBCT would be able to vastly increase its events programme, and the positive outcomes it creates. Our Grade B listed Edwardian building is now a rarity, as Historic Scotland notes: “In 2001 when Govanhill Baths closed, they were the only original, substantially unaltered public baths in the city still in use, making them a rare and important survival. Edinburgh City Council still operates five of its remaining traditional public baths and Dundee has one, whereas Glasgow has closed all of its examples.” Since closure, that historic fabric has been threatened by poor maintenance, making its survival all the more important to protect. Our project will conserve Glasgow’s best-loved and most complete Edwardian municipal bath house and steamie. The Baths will be returned to their original function and the project will restore the Baths much-missed role as the centre of community life in Govanhill. The project team has completed all necessary work to RIBA 3, including a business plan, heritage interpretation plan and community engagement plan. This appointment is for RIBA 4-7.
new community facilities including a kitchen and the conversion of the Steamie as a community and arts space as Meanwhile Use. It is the role of the Capital Project Manager to ensure successful delivery of the above refurbishment and new build programme. 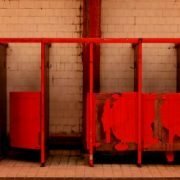 This will involve managing the Design Team and other external consultants, developing partnerships with local organisations, and working closely with programming and operational staff to ensure that the capital works are capable of underpinning the delivery of a sustainable programme and business model for Govanhill Baths. The Project Director will be employed by Govanhill Baths Building Preservation Trust, which is a single-use BPT set up specifically for the delivery of this project. The Director will be answerable to the Board, but will also report on the project to a Steering Group comprised of representatives of both the BPT and Govanhill Baths Community Trust. The Director will support the work of the Learning and Outreach Officer, who will deliver the Activity Plan and the Heritage Interpretation Plan over the life of the capital works programme. The Learning and Outreach Officer is already employed by GBCT, and will be seconded to the CBS for the duration of the capital works. The Director will be supported in their first three months by the Prince’s Regeneration Trust’s Project Manager, who has managed the capital works phase to date. This is to ensure sufficient crossover of information and learning. The contract is for a two year term, with the possibility to extend, on the basis of a 30 hour per week contract.  To oversee and approve construction budgets, programme milestones, and approve all change and cost control procedures. Circa £50,000 per annum dependent on experience, based on 30 hours per week pro-rata. Applicant must be self employed and have a UTR. Start date to be negotiated- expected to be in post mid June 2018. Please provide a summary of your experience and qualifications, making sure to address the key responsibilities and person specification listed above. This should be on no more than two sides of A4, 12point Arial. Please also provide details of two referees. One of whom should be a current/recent employer. Interviews are scheduled for Friday 22nd of June 2018 at Govanhill Baths. Shortlisted candidates will notified by 5pm June 18th 2018. Further information on Govanhill Baths is available at: www.govanhillbaths.com. This project is funded by the Regeneration Capital Grant Fund, the Heritage Lottery Fund, BIG Lottery, Historic Environment Scotland, Glasgow City Council, the Scottish Land Fund, the Robertson Trust, Garfield Weston and the Pilgrim Trust. 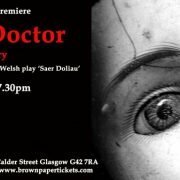 Govanhill Theatre’s production for this year’s Southside Fringe is Glenwyn Parry’s The Doll Doctor. Translated from the original Welsh language play “Sear Doliau” by David Brown and Directed by Bruce Downie, the play examines our obsession with modernisation, the role of women and the power women hold within our society and asks searching questions about our existence and beliefs. Jones goes about his business mending dolls in his workshop until The Girl strolls in unannounced. She takes control of running the workshop and appoints a new apprentice The Boy. Both of them play mind games to unsettle Jones and uproot his settled way of doing things. Rags to Riches, our award-winning upcycling project, are looking to recruit three new people to join our ever-growing team. R2R need a Business Development and Marketing Officer; a Product Development Officer; and a Coordinator for the Scottish Upcycling Network. Full details for each job are below. Are you interested in working in one of the most innovative, exciting environmental projects in the Scotland? For the past 6 years Rags to Riches has developed and delivered a range of innovative upcycling projects? Today we have become a leader in the upcycling field delivering innovation, social and environmental change. We are looking for a creative Business Development and Marketing Officer with extensive experience in business development to help us communicate our message, help people access our upcycling services and products, and importantly, grow the business across Scotland into a self sustaining social enterprise. Energetic, passionate, driven individual capable of delivering a wide range of projects at pace. Applications: Please send us a CV and a Covering Letter, on not more than 1 side of A4 using Arial 12 point, outlining how you meet the required skills and why you would like the post. Please be aware that unfortunately GBCT cannot accommodate interviews outside of this date. Do you want to be part of a team working in one of the most innovative, exciting retail spaces in the Scotland? Rags to Riches has embarked in a new exciting phase and we are manufacturing upcycled products for our new retail store on Victoria Road. Join our creative and passionate team as we adhere to circular economy framework, find new and efficient manufacturing methods and help people access sustainable upcycled products made right here in Govanhill. The Rags to Riches Product Development Officer is responsible for designing innovative upcycled products from concept, technical specifications documentation, prototyping and be well versed in a wide variety of production methods and materials. She / He will also identify new waste streams and link up with businesses and organisations to help with their Environmental Responsibility policies. Applications: Please send a CV and a Covering Letter, on not more than 1 side of A4 using Arial 12 point, outlining how you meet the required skills and why you would like the post. Also include 3 Images/Examples of previous product design work. 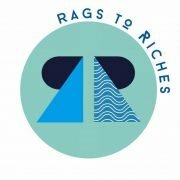 Rags to Riches has embarked in a new exciting phase and we are setting up a new network to support the upcycling sector in Scotland? Join our creative and passionate team as we find new ways to help organisations and individuals to think about upcycling and creative reuse as a mainstream and aspirational option for manufacturing, and trading in Scotland and beyond. The Rags to Riches SUN Coordinator will support the sector to come together and bring about change and increase collaboration between upcycling projects, traders and organisations spreading best practices among members and catalyse new upcycling projects. Develop and coordinate events and forums to facilitate peer learning, support network members, increase the success and sustainability of upcycling and creative reuse practices. Applications: Please send a CV and a Covering Letter, on not more than 1 side of A4 using Arial 12 point, outlining how you meet the required skills and why you would like the post.